Charities find chef challenges and farm-to-table a winning combination. Chef challenges are a growing trend at fundraising events in the region, along with a heightened awareness of local food, farms and produce. 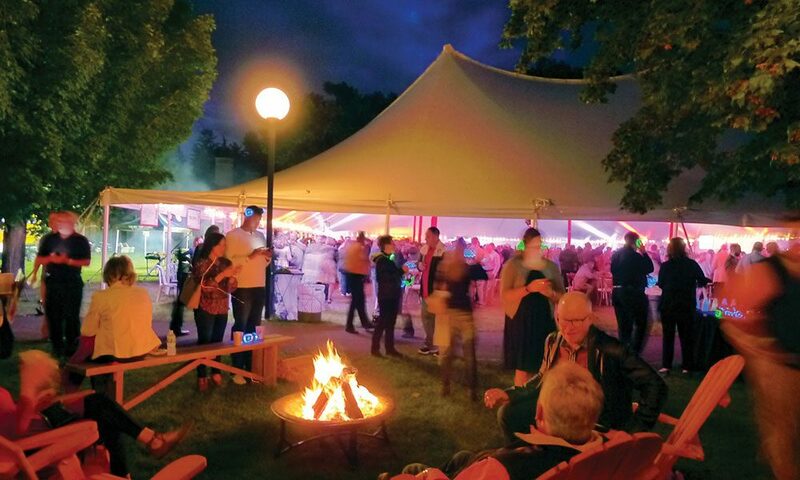 Whether it was specially built fire pits or chefs on the hot seat to win a title, “Top Chef”-style charity benefits were all the rage this year. Sampling dishes at four of these events was easy; choosing favorites was much harder. Fire Feast on the Farm at Pitney Meadows Community Farm in Saratoga Springs was a true showcase of farm to table, with chefs presenting food gathered from the very fields in which they were cooking. Feast of the Fields has been a wildly successful fundraiser for 12 years for Saratoga PLAN, the originator of this type of event, which fits its mission to preserve local farms and woodlands. Dish It Out, a fundraiser to raise awareness about missing and exploited children in the Capital Region, included restaurants from outside Saratoga County, offering a glimpse into the food scene in Troy, Latham and Albany. Fired Up! at Saratoga Performing Arts Center was a kickoff for the Saratoga Wine & Food Festival. It was an unabashed competition, with chefs live-fire cooking for the title of “grill master,” and featured Red Sox superstar David Ortiz and his Arias line of wines. At Dish It Out, chef A.J. Jayapal of Swifty’s, an Irish pub in Delmar and Albany, served up one of the best street tacos I’ve ever had. Cheddar mayo is smeared on a flour tortilla and topped with pulled pork, pickled fennel and an arugula cole slaw, then wrapped into a little pocket of goodness. It was an explosion of flavors: savory, tart and comforting. The other all-star: Vivian Brammer, pastry chef from Prime at Saratoga National, who created an otherworldly carrot cake sundae. 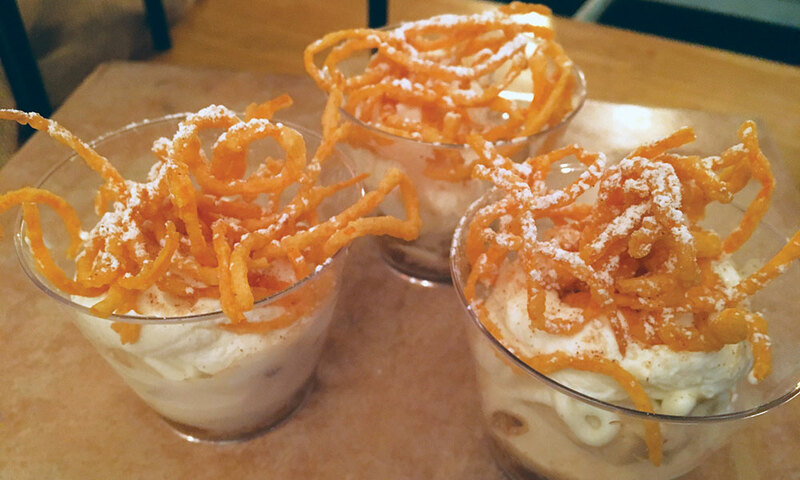 Brammer takes pecan ice cream and layers it with maple butter, carrot cake, vanilla caramel, liquid cheesecake, all house-made, and tops it with crispy fried carrots. A delightful ode to autumn and wonderful departure from all things pumpkin. At Fired Up!, one of my favorite dishes, and the evening’s winner, was from the only restaurant featuring pork at an event dominated by beef. Salt & Char chef Nicholas Karoly’s creation was a mesquite-roasted Berkshire Heritage pork shoulder served North Carolina barbecue style, with a tart, vinegar-based sauce. The tangy and savory pulled pork was topped with a fresh, crunchy corn succotash and sweet pickled Bing cherries. Also noteworthy: the Korean BBQ taco by chef Ken Kehn of Angelo’s 677 Prime in Albany. The Korean barbecue-style tri-tip was accompanied by jicama slaw, sesame garlic aioli, citrus jalapeno, jack cheese, sweet corn and sweet chili vinaigrette, all in a tender flour tortilla. What sealed the deal on this taco, though, was the satisfying crunch from a sprinkle of chicharrones (pork cracklings) on top. At Feast of the Fields, I sampled a dish from The Blue Hen, the new restaurant at the Adelphi Hotel, and it did not disappoint. Chef Mark Plessis presented a crostini topped with salty porchetta, offset by frisee and a spicy plum mostarda; the savory pork blended with the tangy plum all in one bite. 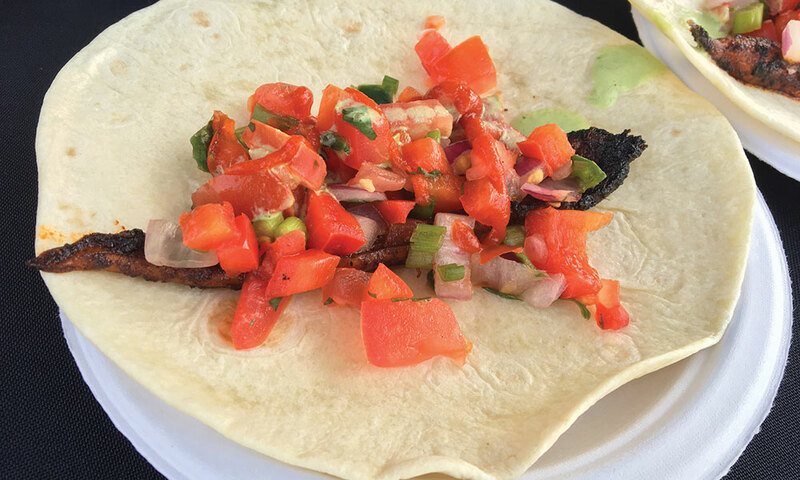 Merry Monk’s Chef Daniel Chessare surprised me with a delicious vegetarian taco starring a spiced, roasted carrot topped with spicy fresh pico de gallo. The taco had a spicy freshness, and a cilantro cream balanced out the spice; it was very satisfying without the weight of the meat. My favorite dish at Fire Feast on the Farm happened to feature one of my best-loved local markets, Moby Rick’s of Saratoga Springs. Jaime Young, chef at Sunday in Brooklyn, was paired with local chefs Kevin London of the Farmhouse Restaurant in Lake George and Dan Spitz of local Fat n Happy Catering. The team presented a whole, grilled and smoked fork-tender striped bass with a bright and fragrant spruce butter, avocado squash chard dressed with roasted pumpkin seeds, honey, aleppo and olive oil. My vote is to continue the live-fire cooking/farm-to-table fundraising trend year-round. We can see how chefs make use of the different foods of the season, while we support area farms and local charities in all seasons.